Question about Sheffield Octagon 1990 date(s). Bit new to this site obviously, but was wondering about Sheffield Octagon 1990 date(s). I’ve had a look here: http://www.808state.com/live/1990/index.htm and it says 808 played in June 1990. Graham, what does your filofax say? out of the blue studios for 3 days -doing tunes b sides? 1st july ILL 2nd July -ILL.
My Filofax is by no means comprehensive despite the fact i used to have it on The "Filo Strap" and used to go out dancing with it strapped on. a profesional photographer for City Life - obviously unconvincingly. Blimey, I'll have to update some of 89 and 90 based on that! 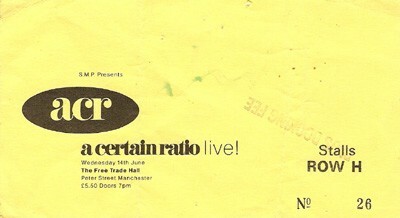 Are you sure that the ACR gig was on the 11th and not 14th June 89? 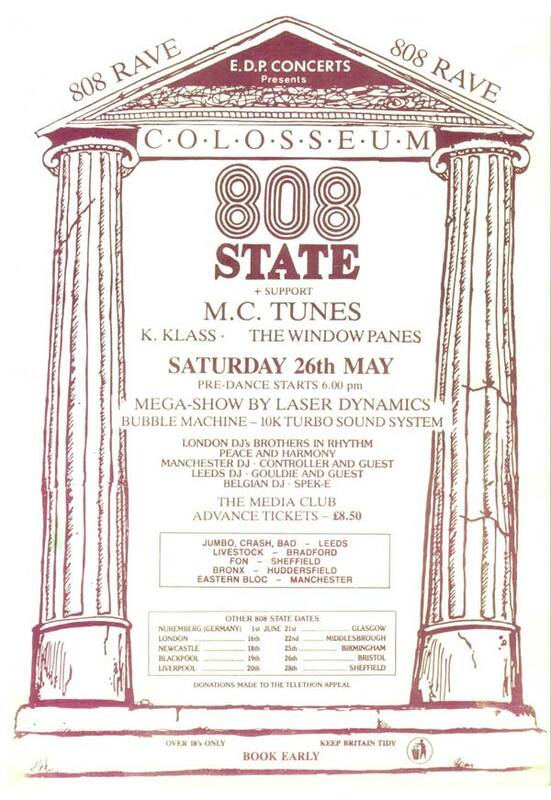 Sat:16:Jun - 808 State Live - London. ???:?? :Jun - 808 State Live - Ibiza 90, Ibiza (with The Farm & The Beloved) - Later broadcast on Channel 4 film "A Short Film About Chilling"
Fri:01:Jun - 808 State Live - Nuremberg - Germany. Which seem to be missing from the Filofax, so I'm assuming they're wrong? 16th of june 90-says american interviews and tape transfers. june 90 went ibiza sat 2nd the gig at Ku was thursday 7th(we played here twice-this isnt the one on optical..) it seems we flew back during this week to do TOTPs on wed 6th and went back to ibiza for the ku gig and then went home on the sat 9th..
fri 1st july-says jap tv london (think this is on you tube )it has only rhyme and pacific and short mc tunes speaking. Leeds collosium 26th may - yes thats right and concures with my 1st post ,Init? oh Nuremberg -- Think we must have canceled that then-defo didnt do it. graham wrote: oh Nuremberg -- Think we must have canceled that then-defo didnt do it. If they did, then Andy and Daz owe you a beer in Dublin! Thanks heaps Just trying to fill in my past. The first ever gig I went to was at Hull university to see A Guy Called Gerald. I think that was in February 1990 and soon after that (or so I thought) I went to see 808 State at the Sheffield Octagon. Following which I went to the Life weekender in Skegness on the 27th of April. So from what you’ve said instead of being A Guy Called Gerald > 808 > Life, it must have been A Guy Called Gerald > Life > 808. After that night at the university, I began getting into dance music and the rave scene more and more. I started buying one or two records and Newt and I went out together again. Next we went to the Sheffield Octagon to a night put on by 808 State. At the venue there was a bank of speakers about the same size as the front of a house at either side of the DJs. The music was excellent and needless to say excessively loud. They put on brilliant light display too – the first I’d ever seen. At one point they fired lasers at some kind of thin netting dangling just above our heads and with it produced a four metre high angel fish swimming in the air. At the party everybody was friendly and looked be to having a great time. Mick Hucknall was sitting in the chill out area and his hair was ginger. Somebody was selling records and I bought a K-Klass white label that was pink for five quid. I got very drunk and thoroughly enjoyed the entire evening, slept my drunkenness off in my car and drove home the next morning. So, pretty soon after going to the Sheffield Octagon, I went to the Amnesia raves near Coventry and took my first little fella. A Guy Called Gerald at Hull University was on Wednesday 14th February 1990 (St Valentine's Day!) - there's a flyer at my site here (also a flyer for the "Life" Skegness rave there too). Good luck with the article/publication! Wow cheers! I had an inkling A Guy Called Gerald was on Valentine's Day, but I wasn't sure. "The Magical Manchester Mystery Tour" rings a bell too. Nice site btw - I'll be sure having a butcher's around it. Thanks once again. Dance International was the 8th June jap tv program. Im sorry there were gold chains ,and there were tracksuites and there were big trainers ,but that was Martin.